PORT MORESBY , Jul 6 2012 (IPS) - The vast Sirinumu Reservoir in Central Province which supplies water and electricity to Papua New Guinea (PNG)’s capital, is home to a co-operative of 60 fish farmers who are successfully employing aquaculture to improve local incomes and food security. Jonah Bobogi from Bausaka village, who lives on an island in the reservoir, established a tilapia fish farm in 2005 and is now the most experienced aquaculture farmer in the southern region. From the early days of his initiative, the National Fisheries Authority (NFA) assisted Bobogi with funding for development and technical expertise, advising him on the suitability of ‘cage culture’ fish cultivation in the reservoir environment. Bobogi now has six breeding ponds producing 20,000 fingerlings per month, which are sold to other farmers in the area, and 12 cages which produce 24,000 table-size tilapia every three months, equating to an income of 12,000 kina (5,870 dollars). The fish are bought by supermarkets, local markets and private customers in the region. With fish an important part of his diet Bobogi uses some small cages which are not part of the commercial project to enhance his family’s food supply. The United Nations Food and Agriculture Organisation (FAO) reports that aquaculture is the fastest growing global food production system, exceeding population growth and accounting for 46 percent of the world’s food fish supply. Aquaculture is set to overtake capture fisheries as a source of fish for human consumption as the FAO reports stocks of the top ten fish species, which total 30 percent of global marine fisheries, are fully exploited. World aquaculture is centred in the Asia Pacific region where 89 percent of production occurs and per capita consumption of fish is above 25kg per year. But in PNG its full potential for food security and local incomes is yet to be realised. In 2007, national freshwater fisheries production was 17,500 tonnes with 200 tonnes attributed to aquaculture. Aquaculture was introduced in the Highlands in the mid-1950s to combat malnutrition with increased protein consumption, and enhance the livelihoods of small farmers in inland areas where 95 percent of the population live within two km of freshwater rivers. The Australian Centre for International Agricultural Research (ACIAR) reported that in 2007 there were 5,418 known fish farms operating in PNG and 10,000-15,000 farms with fish ponds. Fish farmers surveyed, with average families of 6-19 people, consumed 39 percent of fish produced, while the remainder was purchased by local communities. Jacob Wani of the National Fisheries Authority (NFA) claimed small fish farmers were still driving the industry. Further opportunities for aquaculture are expected as sea levels rise, encroaching on coastlines and more reservoirs are constructed in river basins. The main challenges to developing aquaculture and mariculture in PNG include expertise, training, infrastructure and access to adequate supplies of fish feed and fingerlings. The NFA offers basic fish farmer training courses, assistance with feasibility studies and funding to support new aquaculture projects and those with plans to expand. The NFA has also set up satellite feed mills in Morobe, Eastern Highlands, Western Highlands, Jiwaka and Simbu provinces and is subsidising the cost of feed, but aquaculture officer, Gideon Pama, said there was still a huge demand that was not met. “We have asked companies to produce feed, but they want to be assured of sufficient demand for large scale manufacture,” he explained. There are also global environmental concerns about the impact of cultivating non-indigenous fish species and high levels of fish waste in intensive aquaculture. According to the NFA, the main aquaculture species in PNG, tilapia, carp and trout, have been introduced as efforts to domesticate indigenous groupers, mullets and snappers have been unsuccessful. 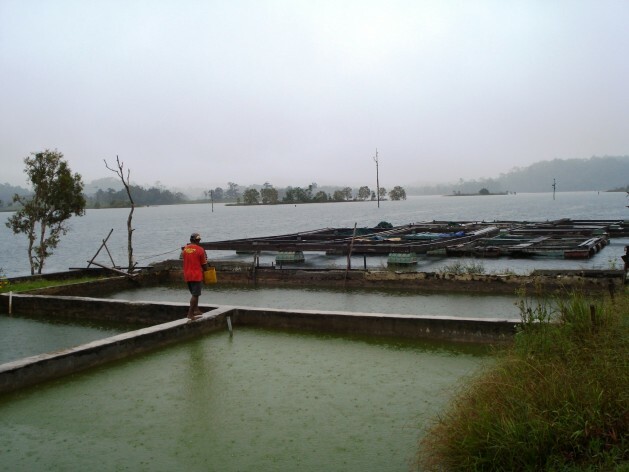 In the Sirinumu Reservoir, which holds only 3-4 species of fish, Pama claims that aquaculture species has had no significant impact on local populations. Eutrophication, the proliferation of algal blooms from a combination of fish excretion waste and nutrients from excess feed, which can pollute waters, deplete oxygen and produce toxins is another ecological concern. However, Pama said PNG, where small scale aquaculture projects are still predominant, had not experienced any disease outbreaks, nor had there been any detrimental cases of eutrophication. Today aquaculture retains its main potential to increase food production and livelihoods in this South Pacific island nation. At the end of the year a hatchery for giant freshwater shrimp will be established at the University of PNG in a joint development project with the SPC and NFA, with funding from ACIAR. The project is set to boost aquaculture research and eventually the transfer of appropriate technology to local fish farmers.